This series of five paintings by Senan O’Brien depict the artist’s love of Country Life, Land and Animal Husbandry. ‘Back to Pasture’ and ‘The Conversation’ immortalise a bygone time of contentment with ‘frugal comfort’. All of the paintings can be seen in our gallery, are beautifully framed and are available at surprisingly reasonable prices. Are these the thoughts of the poacher as he heads home with an empty bag? 'Poacher's Dusk' oil on board, 36x48 cm by Senan O'Brien just off the easel. This romantic image, fresh off the easel of Senan O’Brien, is like a relic of old decency. Beautifully framed, oil on board, 46x61 cm painting would tempt you to immediately decant your best bottle of Grand Cru Chardonnay. 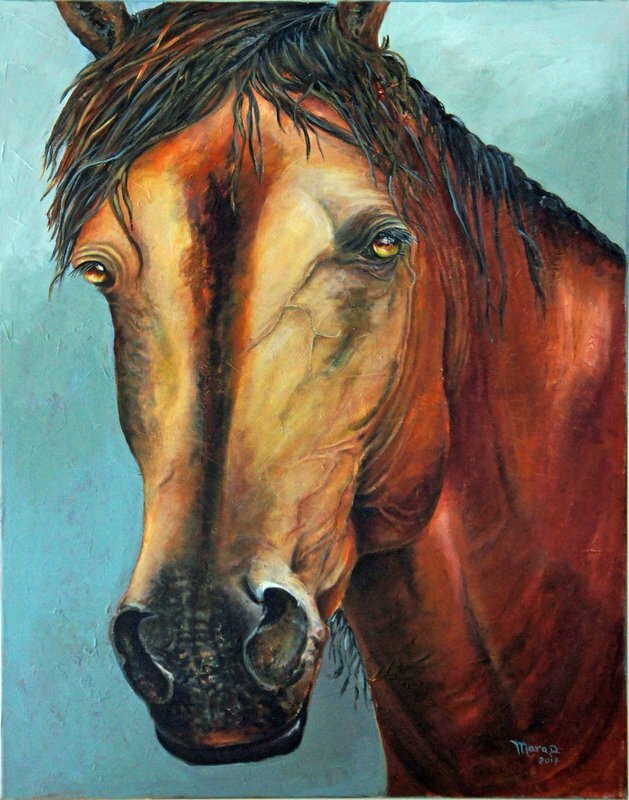 The intelligence, spirit, soul, discipline and fire in the brain of the horse are all captured in this large (101 cm x 76 cm) acrylic painting by Brazilian artist and Wicklow resident Mara. View this and other paintings by this talented artist in our Gallery or ﻿click here﻿ for full details. We are proud to display the very colourful paintings of Mara D, a Brazilian artist who has come to live here after a successful career in London. The bright colours she uses are refreshing, would brighten any home and are an expression of one from her native Brazil. Very reasonably priced (from €70), for original art, any one of these paintings would make the ideal wedding or significant birthday gift. 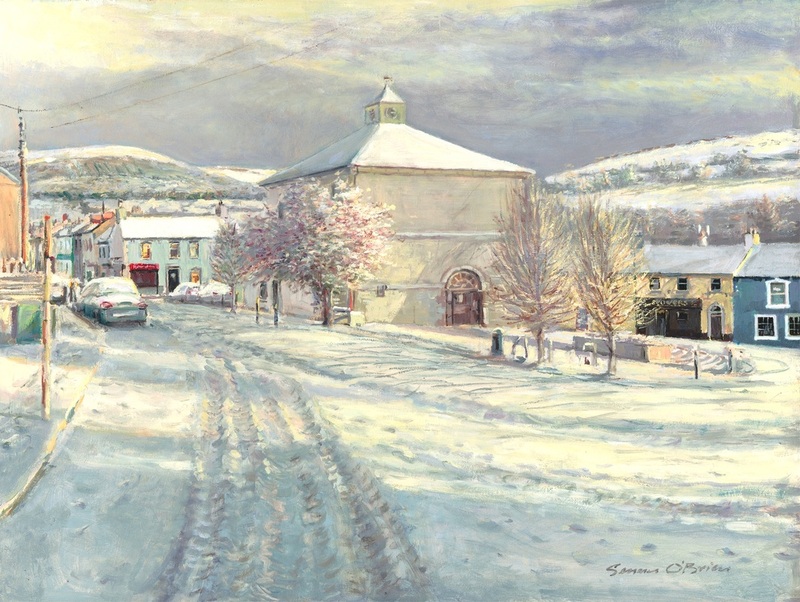 ‘Winter Sunlight’ is a beautiful painting by Senan O’Brien from recollection of a snow covered Tinahely in the recent past. The original oil on gesso panel (45x60 cm) is on view and for sale in our Gallery. High quality limited edition prints on 310 gm museum quality Hahnemuhle paper are also available for €70 unframed. Check out our online store. Michael Gemmell is one of Ireland’s most sought after and collectable contemporary artist. We are very grateful for his continued support of Riverside Art Gallery and are now proud to introduce the following oil paintings: Blue Lake; Boats in Harbour; Colours and Life under the Sea, Ballyvaughan; Lost in the Woods. These are available at prices that would have unheard of just a few years ago. After a spate of Eoin O'Connor print sales we now have our full complement of 19 prints plus 3 originals on display. This includes three new prints: The Hen Pecker, Summer Evening and The Heavens Will Open. All can be seen in the gallery and are available at the same prices as online from Eoin. Click here for more details. 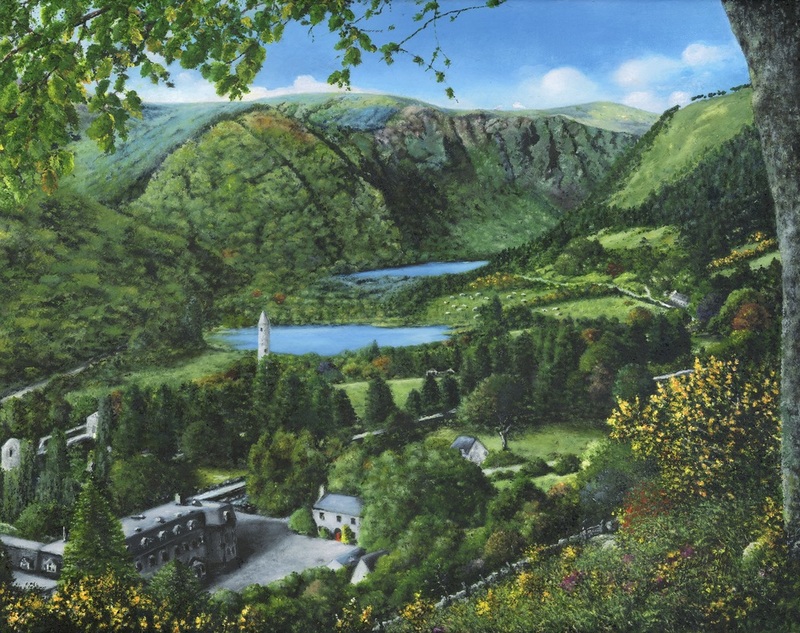 We are very pleased to add Imelda Duffy’s iconic painting of Glendalough to our Print Shop. Glendalough is the jewel in the crown of The Wicklow Mountains National Park and Ireland’s Ancient East. Imelda grew up in the neighbourhood. This painting comes from the soul and captures the true atmosphere of the area. The prints are on canvas ready to be stretched on to a frame and are available from our online store. Gorey artist Deborah Stedmond has produced these representational acrylic paintings on canvas. They are available at a price you might expect to pay for a print. They would, therefore, make an ideal significant birthday or wedding present. For full details click here.